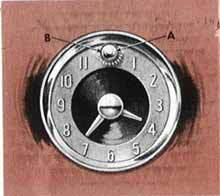 To reset clock, pull knob "A" at top of clock out and turn in desired direction. FAILURE OF CLOCK TO RUN - IMPORTANT - The electric clock requires special attention when reconnecting a battery that has been disconnected for any reason, a clock that has been disconnected, or when replacing a blown fuse. IT IS VERY IMPORTANT THAT THE INITIAL WIND BE FULLY MADE. Make sure that all other instruments and lights are off. Connect one terminal of the battery first. Blown fuse - discharged battery - corroded battery terminals - wire improperly connected to light switch, fuse block or terminal connection to back of clock - or defective clock.